RCI is a wonderful food event started by Lakshmi of Veggie cusine and the current month's event is hosted by Mythili of Vindu. Her choice is Gujarati cuisine. My exposure to authentic Guajarti food was pretty late in life. Better late than never yeah. I have two good friends who happen to be Guajarati and fantastic cooks. Through them I was introduced to goodies like Dhokla, pakoda kadi and Undhiyo, things I didn't know existed before. It will be a sin not to mention the soft rotlis they make. They turn out the same size everytime, soft and almost melting in the mouth. What I like best is that the rotlis stay soft even after hours. It is simply amazing the way Guajaratis create varieties of snacks with chick-pea flour (gram flour). Heat oil in a pan, when hot add the mustard seeds and cumin seeds. When the mustard seeds splutter add the asafetida, turmeric powder and then the potatoes. Stir the potatoes to ensure even cooking. 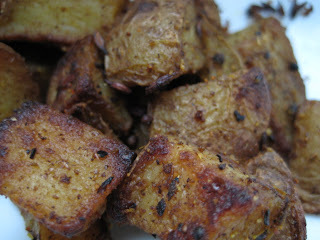 When the potatoes are cooked add the cumin, corriander and chilli powder. Mix well with the potatoes and continue frying for 2 more minutes. Remove from fire and serve as a side dish. It went very well with parupu sadam (lentils and rice). Madhu suggests that the dish can also be served with roast and grilled meat. I love the spices you have used for your potatoes! I think I will have to be a bit more daring with my spices next time I make potatoes! The potatoes must taste great, I love the combination of spices. Nice potato recipe. Itmust have tasted really good. Looks tasty! And quick enough for weekday meal, perhaps with some salad on the side? I've gotta try it.